Originally published under the title, "Davutoglu and Mashaal: A Marriage Made in Heaven." Hamas leader Khaled Mashaal was given a hero's welcome by Turkish Prime Minister Ahmet Davutoglu last month. In the heat of August 1980, Necmettin Erbakan, leader of the now-defunct National Salvation Party and founding father of political Islam in Turkey, published two articles, "Jerusalem and Zionism," and "Anarchy and Zionism." In the latter, he likened Zionism to an "octopus with numberless arms." Some of those arms were "communism, capitalism, freemasonry and racism." Before that, in much of the 1970s, Turkey had been captured by political violence. It had killed on average a dozen people each day in clashes mainly between ultra left- and ultra right-wing militants. The sole source of anarchy and chaos in Turkey, Erbakan then wrote, was Zionism. Shortly after the publication of Erbakan's articles, on Sept. 6, 1980, his party organized the infamous "Jerusalem meeting" in the central Anatolian city of Konya, an Islamist stronghold to this day. Thousands, including children, shouted "Death to the Jew" and marched through the city. Six days after the demonstration, the military staged a coup d'état. The generals not only wanted to crush warring extremists, but also religious fundamentalists. Like most of Turkey's cabinet ministers and ruling MPs, Erdogan comes from the ranks of Erbakan's school of political Islam. Little has changed in Konya's political demographics since the 1980 coup. It still boasts being the center of Turkish political Islam even though, ironically, the city's name is a Turkish distortion of its original medieval Greek name "Ikonion." This August, three-quarters of residents of Konya voted for Recep Tayyip Erdogan, who became the president of the country, with 51.5% of the nationwide vote. Like most of Turkey's cabinet ministers and ruling MPs, Erdogan comes from the ranks of Erbakan's school of political Islam. But these days Konya is even more loudly proud of one of "its own sons." Former Foreign Minister Ahmet Davutoglu, Erdogan's choice, was elected party leader and prime minister this summer. Last weekend, Davutoglu gathered a regional party congress in his native Konya, where enthusiastic locals and party loyalists called him "a true grandson of the Ottomans." The party congress looked like any other congress of the ruling Justice and Development party [AKP]: a fawning crowd, cheering, singing and shouting pro-Davutoglu (and pro-Erdogan) slogans, and waving Turkish and Palestinian flags. But there was more. 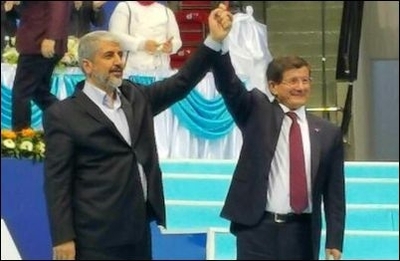 Davutoglu's guest of honor at the party congress in Konya was Khaled Mashaal, head of Hamas's political bureau and the darling of Messrs Erdogan and Davutoglu -- a feeling that is apparently not unrequited. Taking the stage, Mashaal congratulated the Turkish people "for having Erdogan and Davutoglu." Thundering applause, Palestinian flags waving passionately and thousands of AKP fans shouting, "Down with Israel!" Mashaal, who lives in exile in Qatar, shyly boasting an opulent life style, voiced his hopes that, together with the Turkish leaders, that they would "liberate Palestine and Jerusalem." "A democratic, stable and developed Turkey," he said, "is a source of power for all Muslims. [A] strong Turkey means a strong Jerusalem, a strong Palestine." Unfortunately, Turkey is neither democratic, nor stable -- nor developed. The world's most credible pro-democracy institutions, most notably Freedom House, list Turkey in their democracy indices as either a "not free" or a "country with major democratic deficit." The country is scene to constant political bickering, and neighbors, next to Syria and Iraq, one of the world's most unstable regions. Its per capita income is a mere $10,000. In his speech, Davutoglu accused Israel of "attempts to reduce the Islamic character of Jerusalem," and repeated that Turkey and Palestine have a common stance (against Israel). He also declared a new mission for Turkey: the self-declared guardian of Jerusalem and al-Aqsa Mosque. Whenever there is a visiting foreign dignitary, a head of state or a prime minister, Davutoglu will usually meet with his guest bilaterally for an hour or two. In Konya, his tête-à-tête with Mashaal lasted for four and a half hours. "Turkey will do whatever needs to be done to protect Jerusalem and al-Aqsa Mosque," he said. More thundering applause, more Palestinian flags waving and more "Down with Israels." Whenever there is a visiting foreign dignitary, a head of state or a prime minister, Davutoglu will usually meet with his guest bilaterally for an hour or two. In Konya, his tête-à-tête with Mashaal lasted for four and a half hours -- a span not surprising, given the lucrative engagement with "all things Palestinian." Playing the champion of the "Palestinian cause" has traditionally been a smart vote-catcher in the Turkish lands, especially in Konya. Thirty-four years ago, the people of Konya had to take to the streets to shout "Death to the Jew," wave Palestinian flags and chant all possible Quranic slogans -- and clash with the military for doing it. Today, they enjoy the Islamist ritual at the regional congress of the country's ruling party, with "a son of their city" running the show from the seat of the prime minister. Thirty-four years ago, their hearts and minds were united with their Palestinian brothers, but a public "Jerusalem meeting" could earn them a jail sentence. Today, failing to stand by the "Palestinian cause" could earn someone a jail sentence, if not a good public beating. Sadly, this is how democracy has evolved in Turkey.